Morcilla, if you’re not familiar with it, is Spain’s answer to black pudding. I prefer it to most British types, as it’s (usually) mildly spicy with paprika and cinnamon and it is generally less fatty. By all means use your favourite black pudding or the French boudin noir if you prefer. I’ve added apple and onion to it here to make a juicy and aromatic stuffing for a fillet of pork. You can prepare it in advance then pop it in the oven later for a winter supper. 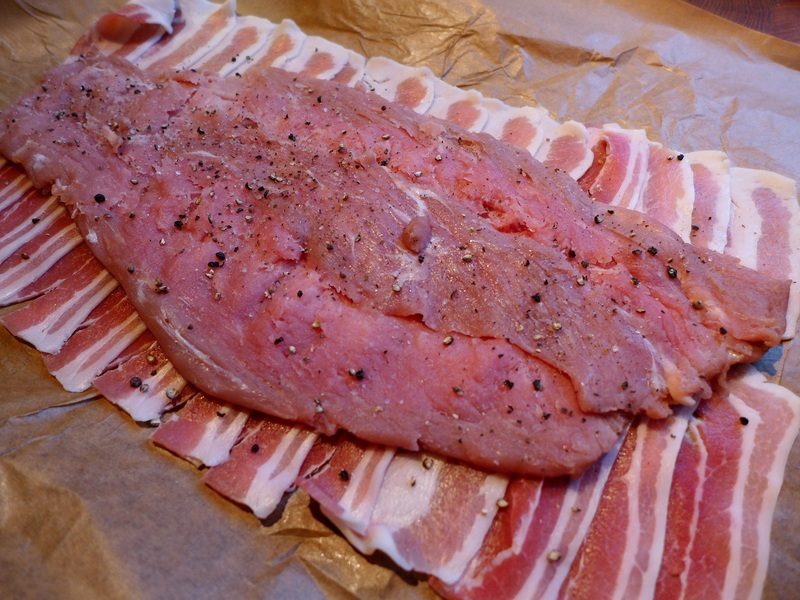 Lay the pork fillet on a board and make two evenly spaced cuts along its length, without cutting all the way through. Lay a sheet of greaseproof paper over it and bash it with a rolling pin until it has flattened out somewhat. Heat the oil in a frying pan and cook the chopped onion until soft and golden. Peel the casing from the morcilla and crumble the sausage into a bowl. Add the apple and onion and stir through. Arrange the bacon rashers on a board, slightly overlapping, into a rectangle slightly larger than the pork. Centre the pork on top and season it with salt and freshly ground black pepper. Put a line of the morcilla and apple stuffing down the middle. 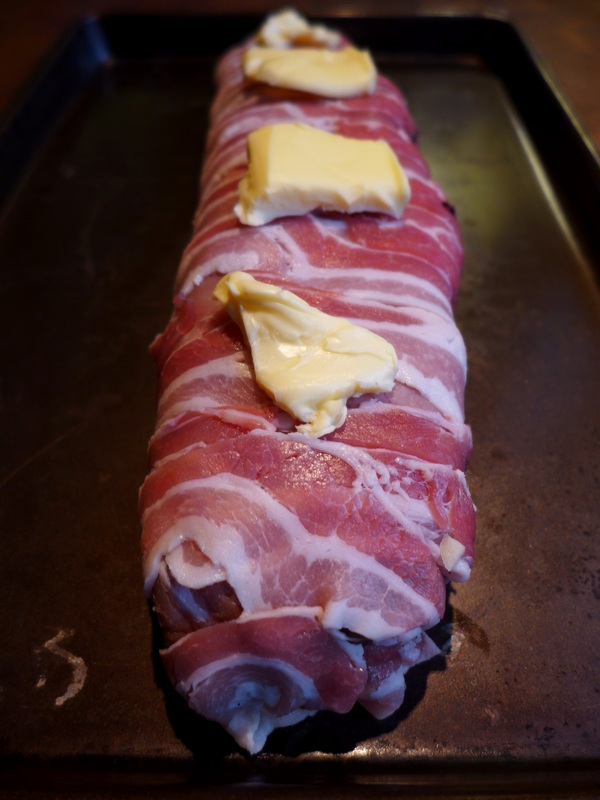 Roll it up, pulling the ends of the bacon rashers on one side into the centre, then the other. You should end up with a fat sausage. Place in the fridge, loosely covered, to firm up for an hour or two (or overnight if that suits your timings better). Preheat the oven to 190C/375F/Gas 5. Remove the stuffed fillet from the fridge. Place it, with the seam underneath, in a roasting tin. Put some knobs of butter on the fillet, cover with foil and roast for 40-45 minutes, removing the foil for the last 10 minutes. Allow to rest for 10 minutes, then slice into rounds and serve. 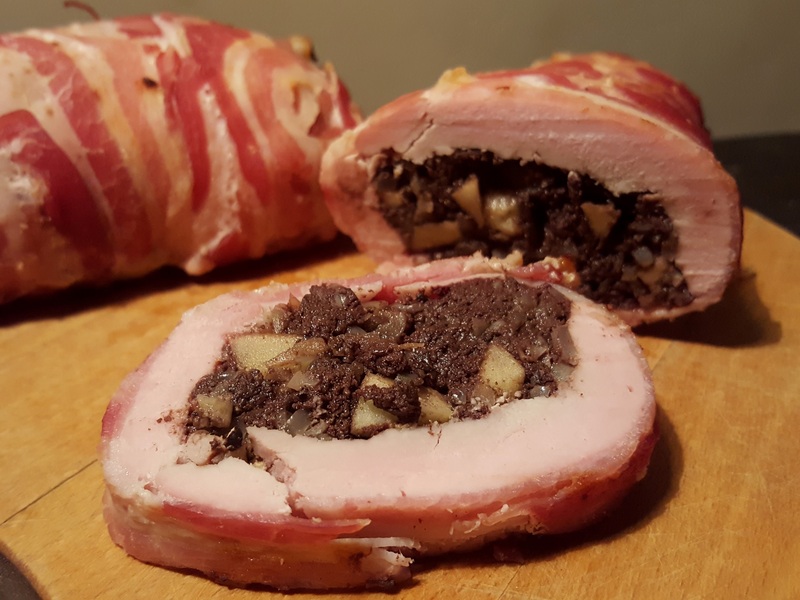 This entry was posted in Mains, Pork, ham and bacon and tagged black pudding, boudin noir, pork fillet stuffed with morcilla and apple, pork fillet with morcilla by Linda Duffin. Bookmark the permalink. I’m not familiar with morcilla, but my new favourite ingredient carried back from Spain is sobrassada, and I think this might work in this recipe.